Current updates about RRB Bilaspur Group D Admit Card 2018-2019 available here. The officers of Railway Recruitment Board Bilaspur ready to reveal the release date of rrbbilaspur.gov.in Hall Ticket 2018 in upcoming months. So applicants can check the official web portal of the Railway Recruitment Board Bilaspur at regular intervals. We had provided complete details about RRB Bilaspur Group D Permission Letter 2018-2019 in this article in a details manner. Therefore, contenders can download RRB Bilaspur Group D Admit Card 2018-2019 from this page or the official web page of the Railway Recruitment Board Bilaspur. Scroll down the article and gather complete details about rrbbilaspur.gov.in Hall Ticket. Now, applicants don’t waste your time for searching RRB Bilaspur Group D Admit Card 2018-2019 in distinct web portals. Because of the officers of Railway Recruitment Board Bilaspur activate rrbbilaspur.gov.in Hall Ticket 2018 15 days before the Written Exam Date. Moreover the RRB Bilaspur Group D Written Exam held on April/ May 2018. So candidates prepare well for the Written Test. Once the officers announce the information about RRB Bilaspur Group D Admit Card 2018-2019 automatically, we will update this article with latest updates. So candidates stay tuned to our web page or the official web portal of the Railway Recruitment Board Bilaspur. Are you in Chattisgarh State and looking for Railway jobs? If your answer is yes then apply for RRB Bilaspur Group D Recruitment 2018 notification for 1159 Group D (Track Maintainer Grade IV (Trackman), Gateman, Pointsman, Helpers in Electrical/ Engineering/ Mechanical/ Signal & Telecommunication departments, Porter & Other) vacancies. The job hunters don’t lose this opportunity and apply before the last date. Because there is no more time and an immense number of applicants participated and started their preparation for the Written Exam. So remaining candidates also utilize this convenience. Before going to the Written Exam, applicants need to download RRB Bilaspur Group D Admit Card 2018-2019 because this is a Permission Letter to allow into the Examination Hall. Mostly, all the applicants have to know the value of RRB Bilaspur Group D Admit Card 2018-2019 at the time of written examination. So aspirants don’t forget this article at the time of release by the Railway Recruitment Board Bilaspur. Contenders have any doubts about downloading process can follow the given steps. In the below sections, we had apparently explained every aspect transparently. If you have any doubts about this article, then check the official web page of the Railway Recruitment Board Bilaspur whether this information is correct or not. Candidates need to carry documents along with RRB Bilaspur Group D Admit Card 2018-2019 at the time of attending the Written Exam. Applicants have to know the importance of ID Proofs. So don’t forget this first evidence at the time of appearing at the Examination Hall. Every candidate has their unique details. That unique details had printed on the RRB Bilaspur Group D Admit Card 2018-2019. By using that information only, contenders can easily download rrbbilaspur.gov.in Hall Ticket 2018 from the official web page or this page. In this section, we had mentioned some information that is available on RRB Bilaspur Group D Admit Card 2018-2019. So aspirants remember this data at the time of downloading rrbbilaspur.gov.in Hall Ticket 2018 from the official website of the Railway Recruitment Board Bilaspur. 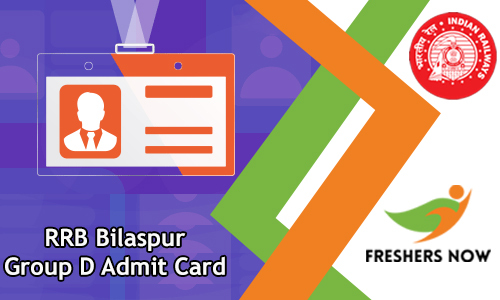 Applicants want to know how to download RRB Bilaspur Group D Admit Card 2018-2019 from the official web portal or this page. For that reason, we had mentioned some steps about how to get rrbbilaspur.gov.in Hall Ticket 2018 from the official web page in an understandable manner. Aspirants can use this information at the time of download RRB Bilaspur Group D Admit Card 2018-2019. Participants stay tuned to our web page freshersnow.com or the official web portal of the Railway Recruitment Board Bilaspur to know more updates about this article. Now, visit Railway Recruitment Board Bilaspur official web page @ rrbbilaspur.gov.in. Now, you have to see RRB Bilaspur Group D Admit Card 2018-2019 link on the home page. Press on that link, and you have to get the login page. Fill the login page with his/ her login details means Login ID and Password. Now, you have to get the rrbbilaspur.gov.in Admit Card 2018 in the pdf format. You have to check the details that have to mention in the RRB Bilaspur Group D Call Letter 2018. If you want any changes to occur, then complete to the officers of Railway Recruitment Board Bilaspur through Email. There are no changes to occur, then download the RRB Bilaspur Group D Permission Letter 2018-2019 by hitting the download button. Therefore, also take a print out for the further use. Finally, applicants also use the above link to download the RRB Bilaspur Group D Admit Card 2018-2019 from this page. Participants have any confusions about this article then leave a comment in the below reply box. Therefore, aspirants stay connected with our web page or the official web portal of the Railway Recruitment Board Bilaspur to know more updates about this article.